We do this silly segment on Glenn Clark Radio every week called "Would You Rather Wednesday." It's a (mostly) Baltimore sports-centric play on the famous drinking/parlor game. Drew Nicholas is a beloved figure among Maryland basketball fans. Just the first three videos of his legendary 2003 buzzer beating shot to beat UNC Wilmington have combined for more than 250,000 views on YouTube. He remains a wildly popular figure throughout the region, and his heroics have never been forgotten. And more than two-thirds of Glenn Clark Radio listeners said they'd rather be a beer vendor. "This has been my part-time job all my life," Clarence "Fancy Clancy" Haskett said on Glenn Clark Radio March 20. "I've always had a real job but this has been my part-time job. I've always put a lot of energy into this part-time job and if you've ever seen me work, you know it's a lot of energy. I just take it to another level, that's all." We all of course know that Haskett, the popular figure at Oriole Park at Camden Yards, has become so much more than a beer vendor. He's a local icon. He's part of the furniture here. When you bring someone to an Orioles game for the first time, you show them the old Memorial Stadium "Time Will Not Dim The Glory Of Their Deeds" dedication, you take them to Boog's for a sandwich and you go see Clancy for a beer. And this season, you can enjoy a Fancy Clancy beer even before or after the game. 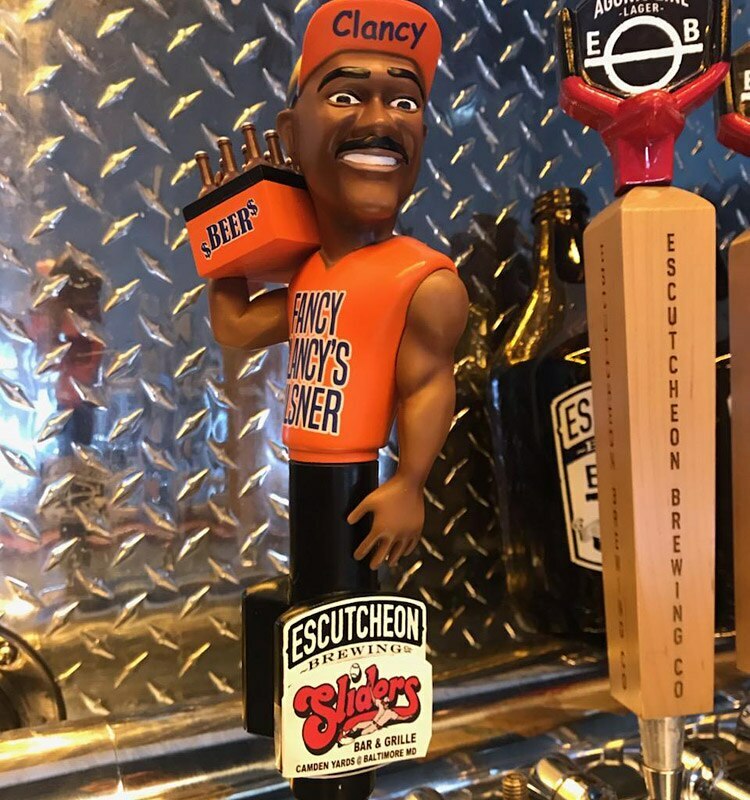 Virginia's Escutcheon Brewing has partnered with Sliders Bar & Grille near Camden Yards to unveil the "Fancy Clancy Pilsner," which will debut on Opening Day. Haskett considers it the pinnacle of his time in the public light here. "No, it don't get too much better than that," Haskett said. "I have a lot of history over my career -- 45 years, this is the start of my 46th year. I've got a lot of history but this right here is at the very top of the cake. My goodness!" Most of us are aware of Haskett's near-ubiquitous presence at Orioles games. His legend is perhaps comparable only to that of the late "Wild Bill" Hagy in terms of significant figures who have been completely unrelated to the actual team. But how exactly did Haskett even become "Fancy Clancy?" You'll have to let him explain. "I started when I was 15," Haskett said. "I wasn't selling alcohol then, I was too young. As I got a little older and I started selling beer and I was in college, I was an All-American sprinter at Catonsville Community College. "At that point I had the little personality where every time I said something it was like a rhyme: 'Don't stand in line, buy mine,' and 'Empty your pockets, put your money in your hand 'cause here's Clancy, your beer man.' So I had a lot of rhymes with my sales. So my personality started to develop then. "And then we were pouring the beer in the cups and then over the years, I guess around the mid-80s, somewhere around '87 or something like that, I was able to pour a beer out of the can into the cup with one hand. And then I just taught myself to pour a beer out of the can into the cup with two hands -- so I had two hands [each] pouring a beer. "And then one day at home I said, 'Let me try this behind my back,' so one day I tried it behind my back and then I started doing it at the stadium and a customer came past. He said, 'Wow, that's pretty fancy, Clancy.' And ever since then I've been known as 'Fancy Clancy.'" Haskett says his success hasn't been built on rhyming and skillful pours alone, but also on a bedrock philosophy of sales in general: developing relationships. He takes time to learn customers' names and what they'll want, and they keep coming back. "I have people coming to me and saying, 'Clancy, I'll be 21 on such and such date. I'm coming to the game after my 21st birthday, I want to buy my first beer from you," Haskett said. "And then guess what? That is the grandkid of a parent that I used to serve in the late 70s!'" And it's not just at the stadium where fans recognize Haskett. "No matter where I go out in the state of Maryland," Haskett said. "I teach a training class for the Maryland State Highway Administration, so I'm all over the state. You'd be surprised, in every single training class someone says, 'I recognize you man, where do I know you from?' And the first thing I say is, 'Do you go to the Orioles games?' As soon as I say that, they know where they know me from." Haskett's vending opportunities have taken him to 27 different stadiums -- including Pittsburgh's Heinz Field, where he actually worked a Monday Night Football game in 2008 that also happened to be then-Ravens quarterback Joe Flacco's first game in the rivalry. Those trips have included working multiple Super Bowls. "I'm down in New Orleans working the Super Bowl when New England beat St. Louis [in 2002]," Haskett said. "And you know, nobody knows me in New Orleans at the Super Bowl. And this lady taps me on my shoulder and said, 'Are you Clancy from Baltimore?'" That's not even the most remarkable moment he's experienced at a Super Bowl. "I was in Miami working the Super Bowl when Denver beat Atlanta [in 1999]," Haskett said. "Back then, I was an out of town vendor so I didn't have beer. So I had an off product. I was selling like bottled water and Lemon Chills or something like that. Eddie Murray was in the stands. Eddie Murray stood up and put his hands up and waved at me and made sure that I recognized him. And I went over and shook his hand and said, 'What's up Eddie?' And you know, that blew me out of the water because a celebrity like Eddie Murray was gonna stand up and have me recognize him! That blew me out of the water!" I've officially switched my Would You Rather Wednesday vote to Fancy Clancy. Few local figures are so universally beloved like Haskett. Even our most popular athletes (outside of, say, Brooks Robinson and Lenny Moore) have had their detractors for on- or off-field reasons. But Haskett is beloved by everyone. There aren't many others in that category. Outside of Robinson and Moore there's … University of Maryland play by play voice Johnny Holliday? Anyone else? That's the company Fancy Clancy keeps. Kids go out on Halloween in Fells Point dressed up as him! "This one guy said, 'Hey Clancy, can I borrow your hat? Hey Clancy, can I borrow your jersey?'" Haskett said. "I said, 'Sure, what are you going to use it for?' [He said], 'I'm gonna dress up as you for Halloween.' He said he dressed up as me for Halloween and when he was down in Fells Point everyone pulled him up to say, 'You're the beer man from the Orioles!'" Haskett typically stops drinking from Jan. 1 until the start of baseball season in order to get in shape. He admits that during the baseball season he'll enjoy beers, but you won't be surprised to learn he regularly doesn't have to pay for his own. Haskett made an exception this year in order to try his namesake brew before it's available to the public. He's pleased. "Very good tasting," Haskett said. And even if you're not a drinker, you might want to get to Sliders just to see the incredible beer tap homage to a beloved Baltimorean. "They're real nice!" Haskett said. "I like it! I told them to put extra muscles on the arms!" Current and former Ravens joined Glenn Clark Radio to discuss the impact of free agency on the team. Here's what they had to say. Former NFL receiver Derrick Alexander, an original Raven from the 1996 squad, is back in town as Morgan State's wide receivers coach, and Glenn Clark says that's great for Baltimore.